Not only do they provide warmth for a cozy evening under the stars, but they also create a more intimate atmosphere for social gatherings and provide a focal point for guests to gather around while swapping stories or celebrating. Depending on the type of fire pit you install and the accessories you have, you may even be able to cook full meals over the open flame or, at the very least, roast hot dogs and marshmallows with your kids. In order to get the most enjoyment out of this backyard feature, it is imperative that you follow a few simple safety guidelines and maintenance tips to keep your pit in good working order and to keep you, your family and your guests safe while enjoying time around the fire. Before you install a fire feature in your backyard, make sure you check off each of the tips on this pre-installation checklist. 1. Check with your local governing body to inquire about regulations pertaining to fire pits. Some cities and counties have strict rules about where they can be placed and how large they can be, while other cities may not allow pits at all. If you live in a community with conditions, covenants and restrictions (CC&Rs) regarding the use of your property, a homeowners’ association (HOA) or another governing body, you will also want to make sure there are no relevant regulations or restrictions before you invest in this backyard improvement project. You will also need to stay updated on burn ordinances or burn bans in your area. 2. Purchase a fire extinguisher. Before you have your pit installed and began to enjoy backyard fires, purchase a good fire extinguisher with a Class A rating to have on hand in case of emergency. Read the instructions, keep your extinguisher serviced and ready for use, store the extinguisher in close proximity to your fire pit, and make sure that everyone who may use the pit knows where it is and how to use it. Alternatively, you can also keep a bucket of sand nearby or a garden hose as other fire-extinguishing options. 3. Plan for proper ventilation. Fumes from your fire feature can pose a health hazard, so choose a spot that is not in an enclosed area and has good ventilation. 4. Carefully consider fire pit placement. Your fire pit should be at least 10 feet from structures and anything flammable in your yard, but – depending on the size of your fire feature – it may need to be placed even farther away from your home, fences, covered patio or out buildings. If you are installing the pit yourself, read the manufacturer’s instructions and recommendations for pit placement. You will also need to make sure there are no overhanging tree branches or other potential fire risks in the area. When determining placement, take wind into consideration. Windy conditions can blow sparks far from your pit and start a fire, so if you live in a windy area, place your pit in a place that is protected from the wind. 5. Plan a firebreak into the design. Even if your pit is installed properly and you take measures to use it safely, wayward sparks will fly and accidents happen that could send embers or a burning log toppling out of your pit and onto the ground. Prepare for this possibility by planning a firebreak into your fire feature design. This could be as simple as making a ring of gravel around your pit, or you can further enhance this landscaping feature by adding a paving stone patio around the pit. 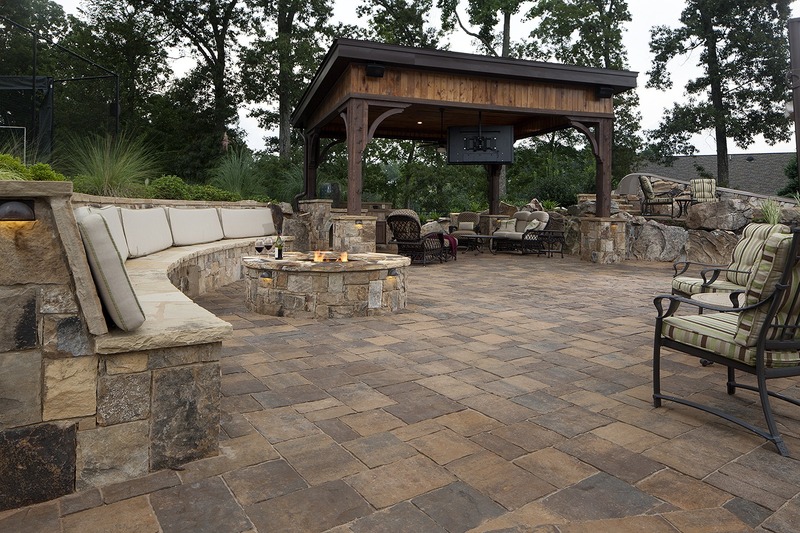 Pavers are a great choice for use in a patio surrounding a fire pit and provide the perfect surface for a seating area for your guests. 6. Consider purchasing a screen or installing a pit that comes with a screen. While a glowing, uncovered bonfire might be just the look you are going for, a screen can help provide protection and keep wayward embers and sparks at bay. If you plan to install anything more than a portable fire bowl, it is a good idea to consider professional installation for this backyard improvement project. While handy homeowners can certainly make this a DIY home improvement, professional installers are well versed in fire pit placement and designing fire features with safety in mind. 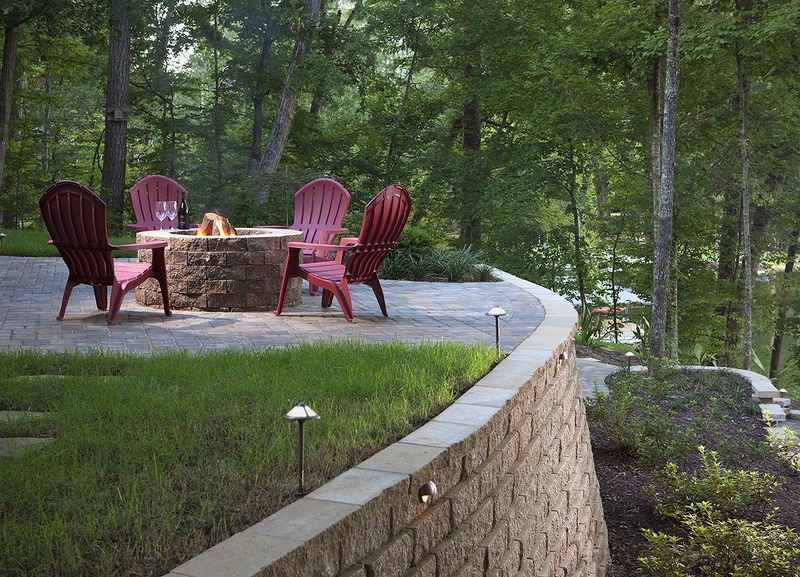 Once you have your pit installed, it is time to start enjoying your new landscaping feature. But before you invite the neighbors over for your first bonfire, make sure you know how to safely start and maintain a fire in your backyard. Here are 10 fire pit safety tips to help keep you and your guests safe while enjoying a backyard bonfire. 1. Clear the area, and clean the pit. Before lighting a fire, always make sure your pit and the area surrounding it are free from dry leaves and debris, particularly the flammable sort. If you have not cleaned your pit since your last fire-lit soiree, now is a good time to empty the ashes and clean the fire bowl in preparation for your next backyard fire. While you are making sure your pit is ready for use, make sure you have your fire-extinguishing supplies nearby and ready for quick use. 2. Use the correct fuel. If your pit is gas fueled, read the manufacturer’s instructions to find out exactly what kind of fuel you should use for your fire feature. Be sure to only use the type of fuel your pit is designed to burn. If you have a wood-burning fire pit, always use dry, seasoned sticks or wood for a safer fire. While it might seem like a good idea to recycle that broken wood patio furniture or extra deck wood by using it as fuel for your fire, you should never burn wood that has been painted, stained or chemically treated. Because wood-burning fireplaces and pits put out unnecessary pollution, you might want to consider using environmentally friendlier manufactured fire logs or other fuel sources safe for use in wood-burning fire pits. It might be tempting to toss some lighter fluid on your fire to get it going, but accelerants are not necessary, can cause dangerous flare-ups and introduce more chemical pollutants into the air. Wood fires can be started with crumbled up paper placed beneath kindling or small sticks, but it is generally safer to use store-bought or pre-made fire starters, since burning paper can be picked up by the wind and blown throughout your yard. Once you have your fire starter or kindling lit, build your fire slowly by placing small sticks and allowing them to begin burning before graduating to larger pieces of wood. The wood you use should never be longer than the diameter of your fire bowl and should easily fit into the bowl without sticking out or leaning against the side. 4. Use a spark screen. If you have a screen for your pit, place it over the fire to help keep burning embers and sparks under control and in your pit. 5. Keep an eye on the kids. Kids tend to love watching the flames of a glowing fire just as much as adults do, but they may not be as savvy about fire safety. If there are children present when you are planning to use your fire feature, make sure they know to stay at a safe distance and never leave them unattended. 6. Keep seating at a safe distance. Fire pits are no fun if you cannot gather around them watching the flames and enjoying the warmth while visiting with guests, but sitting too close to the fire can lead to your guests or your furniture being harmed. Even the best-tended fires have flying sparks that can burn your guests or the fabric of your favorite patio furniture cushions, so keep your seating options a safe distance from the flames. If your plans for the evening including roasting marshmallows or hot dogs with your guests, make sure you use appropriate forks or skewers that are designed for use over an open flame. Outdoor cookware specifically designed for use with fire pits or campfires is a safer option that is usually made with long metal prongs and wood handles. This keeps your hands safely away from the fire while roasting your tasty treats. If you plan to grill meat or vegetables over your fire, be sure to use a well-fitting grill that is made to properly fit your fire pit and cooking accessories designed for outdoor grilling. 8. Never Leave Your Fire Unattended. If you plan to invite guests over for a backyard gathering that includes gathering around the fire, make your fire pit a central focus of the party. If you need to leave the area to prepare food or freshen up your guests’ drinks, make sure to leave a responsible adult in charge of the fire while you are away. 9. Extinguish your fire properly. At the end of the event, extinguish your fire before you retire for the night. It may be tempting to just let it burn out while you say good night for guests and prepare for bed, but this is an unnecessary risk that could result in a call to 911 in the middle of the night. Simply dowsing the flames with water and leaving your fire to die out can result in later flare-ups once left unattended. To properly extinguish a fire, allow it to burn down and use the majority of the fuel still in the fire bowl. Then spread the ashes out in your fire bowl to allow them to cool off. Once your ashes have cooled, slowly pour water over the ashes to make sure there are no hidden embers still burning. If steam is rising from the ashes, you need to keep adding water until there is no more steam. 10. Keep your fire pit clean. For the safest, most enjoyable backyard fire experience, keep your fire bowl or fire pit clean and in good repair. To properly clean your fire feature after the ashes have completely cooled, the first step is removing any unburned or partially burned pieces of wood. This wood can be kept for later use, so you may want to keep a metal pail on hand for storage. Once the larger debris has been removed, use a sturdy broom or brush to sweep the ashes into the center of your fire bowl. Use a metal dust pan or similar tool to scoop the ashes out of your fire pit, and place them in a metal ash can for disposal. If your fire pit has vents or a drain, make sure these features are not clogged with ashes and are working properly for your next party. You can clean your accessories, such as grills or spark screens, with a wire brush and soapy water. 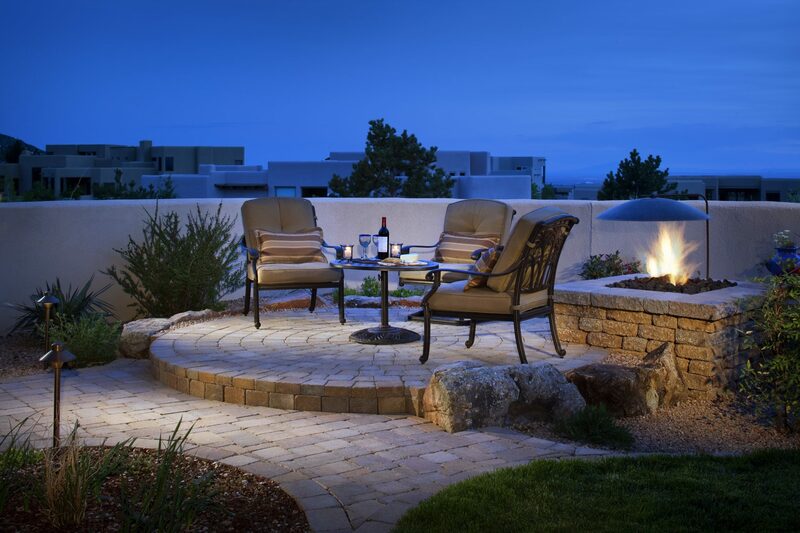 Fire pits are one of the most sought-after features in backyard landscaping, particularly in areas like San Diego where outdoor entertaining is possible throughout the year. 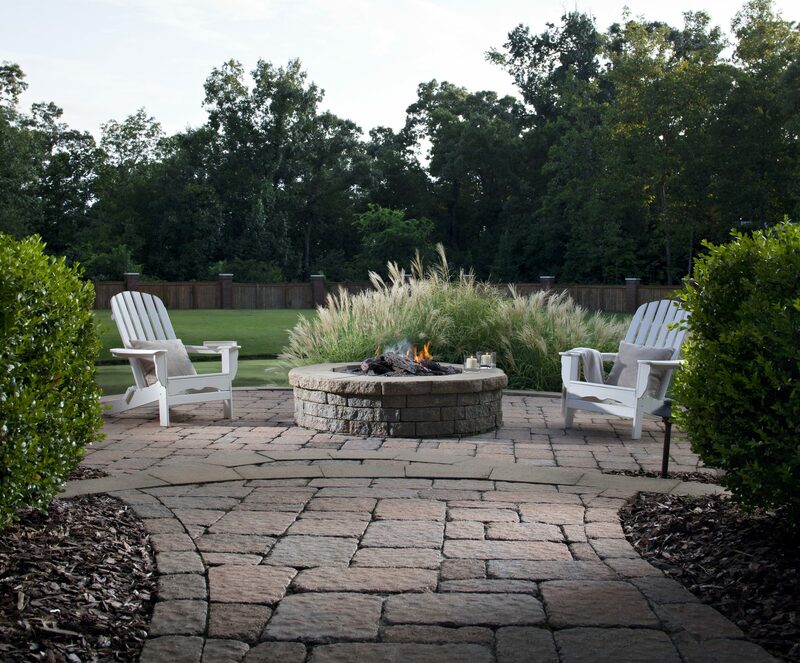 Potential buyers often look for this backyard improvement when looking for a home, and current homeowners are requesting fire pits in their landscape remodels more and more. Fire features are a fantastic way to improve your outdoor living spaces and create backyard entertaining areas that are inviting and visually appealing. Get the most out of your fire pit by following these safety and maintenance tips to keep your guests safe and your fire feature working properly.